This week’s theme is garden accessories, grilling gear, kitchen items, housewares, clothing and footwear, and a few items related to Earth Day. Gardenline Tumbling Composter, $39.99. Turning your kitchen and yard waste into compost can help to keep a lot of waste out of landfills, and it’s not hard to compost. 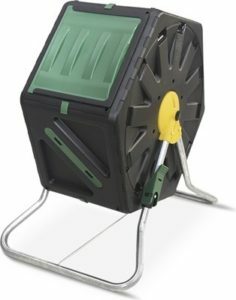 This tumbling composter holds 18.5 gallons and features UV-protected, heavy-duty, all-season construction that’s fast and easy to assemble. No hand mixing is needed; and Gardenline says you should get ready-to-use compost in 4–6 weeks. This composter was not available in all Aldi stores last spring. We do a lot of composting at our house, and we’re hoping the tumbling composter shows up at our local stores this year because we’d really like to try it out. Gardenline Hammock with Carry Bag, $14.99. Features thick braided ropes with steel-reinforced loops. Includes 2 sturdy suspension straps with carabiners for easy hanging. Made for indoor/outdoor use, with assorted varieties available. We purchased a different hammock from Aldi, the Adventuridge Travel Hammock, last year and put it to use during several camping trips, and we’ve been happy with it. Gardenline 6-Pack Solar Lights, $9.99 per pack. Gardenline Hanging Basket Assortment, $4.99. Plants not included. Measures 14″ diameter. Also available: Gardenline Replacement Coco Liner for $1.99. Gardenline Hummingbird Feeder, $6.99. Dishwasher safe. Perky Pet Hummingbird Nectar, $3.99 for 64 oz. Gardenline Hanging Basket Stand, $9.99. Measures 4o”. Plants not included. Gardenline Trough Planter, $8.99. Plants not included. Measures ” x 7.34″ x 8″. Also available: Gardenline Replacement Trough Coco Liner for $2.99. Gardenline Plant Bracket or Caddy, $2.99 each. Plant Bracket: 12″ x 0.6″ x 4″, Caddy 13″ diameter. Gardenline Trellis, $9.99. Measures 66″. Gardenline Garden Fence Panel, $7.99. Measures 36″ x 30″. Gardenline Pruner Set, Shears, 6-in-1 Tool, or Micro Pruner Set, $6.99 each. Gardenline Anvil or Bypass Lopper, $9.99. Total length: Bypass Lopper 28.7″, Anvil Lopper 29.5″. Cutting capacity: 1.4″. Gardenline Potting Bench, $39.99. Measures 29.9″ x 14.6″ x 36.2″ and includes 2 shelves. Gardenline Plant Stand Assortment, $9.99. Plants not included. 3-Tier: 22″ x 24.8″ x 11.8″, 2-Tier: 25.6″ x 13.8″ x 7.7″, Plant Stand Lg: 14.8″ x 9.8″ x 9.8″, Sm: 10.8″ x 8″ x 8″. Gardenline Natural Defense Owl, $8.99. Range Master 4 Burner Gas Grill, $149.99. Features porcelain-coated cast iron grates, built-in tool hooks, bottle opener, and thermometer. You can read some of our thoughts on this grill here. Range Master Cushion Grill Mat, $12.99. Measures 30″ x 48″. Assorted varieties available. Range Master Grill & Bake Mats, $4.99 per pack. Sold in a two-pack. Range Master 65″ Gas Grill Cover, $9.99. Fits most 4- or 5-burner gas grills. Range Master Tongs, Spatula, or Brush, $2.99 each. Crofton 2.3-Quart Porcelain Teakettle, $19.99. Assorted varieties available. We tried this teakettle last year and weren’t happy with the way water leaked from the spout, although this one appears to be updated. Read our review here. Crofton 12-Quart Porcelain Enamel Stock Pot, $19.99. Crofton 4-Quart Porcelain Enamel Casserole, $14.99. Assorted varieties available. Crofton Acacia Wood Utensils, $2.49 each. Huntington Home Cotton Tablecloth, $9.99. Huntington Home Oversized Drying Mat or 2-Pack Kitchen Towel Set, $3.99. Assorted varieties available. Crofton Glass Hydration Bottle, $6.99. Features 24-oz. capacity. Assorted varieties. Crofton 4″ Ceramic Knife, $4.99. Crofton Ceramic Nonstick Fry Pans, $14.99. PFOA and PTFE free. Huntington Home Reversible Chair Pad, $7.99. Assorted varieties available. SOHL Furniture 24″ Industrial Stool, $29.99. Huntington Home 3 Wick Candle, $3.99 for 14.5 oz. Serra Ladies’ 2-Piece Modal Pajama Set, $14.99. Sizes S–XL. Assorted varieties. Royal Class Men’s or Serra Ladies’ Hotel Slippers, $4.99 per pair. Men’s 7/8–11/12; Ladies’ 5/6–9/10. Lily & Dan Children’s Memory Foam Canvas Shoes, $6.99. Sizes 5/6–2/3. Assorted varieties. Easy Home 10 Gallon Recycling Bin, $6.99. Huntington Home Canvas Market Tote, $4.99. Assorted varieties. Serra Spring Tote with Coin Purse, $9.99. Assorted varieties. Allerease Organic Cotton Allergy Protection Pillow, $6.99. Measures 20″ x 28″. Huntington Home 300 Thread Count Organic Sheet Set, $34.99 per set. Queen or King in Gray or Ivory. Crofton Cork Travel Cup, $3.99. Features 18-oz. capacity. Huntington Home 6′ x 9′ Earthkind Indoor/Outdoor Area Rug, $18.99. Made with recycled material. Assorted varieties. Huntington Home 30″ x 46″ Chindi Rug, $4.99. Made of 100% recycled material. Assorted varieties. Specially Selected Fresh Rack of Lamb, $9.99 per lb. Specially Selected Fresh USDA Choice Bone-In Ribeye Roast, $6.99 per lb. Limit two, while quantities last. Fresh Atlantic Salmon Steaks, $9.99 per lb. Fresh Lemon Rosemary Spatchcocked Chicken, $3.79 per lb. USDA Choice Beef Sirloin Tip Roast, $3.99 per lb. Feldschlößchen Maibock, see price in store. Contains 67.6 oz. This seasonal craft lager is imported from Germany. Aldi states: “Both crisp and smooth, with sturdy hops and caramel sweet malty yet spicy character, this is a brew designed for spring, and equally excellent year round. Pairs well with spicy dishes, pork, sausage, ribs, smoked meats, pretzels, and white cheddar.” Alcohol Content is 7.2%. Plow & Press Rosé, see price in store. Contains 750 mL. This is from Monterey County, CA. Aldi states: “Aromas of cherries, strawberries, and raspberries with notes of tropical fruit. Perfect companion to seafood, poultry, sandwiches, wraps, and salads.” Alcohol Content is 13.4%. Allerease, Crofton, Feldschlößchen, Gardenline, Huntington Home, Lily & Dan, Perky Pet, Plow & Press, Range Master, Royal Class, Serra, SOHL Furniture, Specially Selected. Bookmark.